How does your character define themself? What part of their identity is most important to their personality and self-presentation? This is this week's Blog Azeroth Shared Topic, and you can post links to your responses in the thread here! In meatspace, we have so many affiliations, it's anyone's guess whether we consider ourselves a tuba player first, or a student, a Gators fan, a New Yorker, a mother, a nerd, a liberal. Our identities are comprised of so many different aspects of life that it's hard to tell which parts different people will choose to define themselves. For folks who RP, or at least secretly think about things like their character's backstory and personality (hello), these criteria can be easily ordered and defined. I want to give my own answers and hear other RPers' responses, but I'm particularly interested in non-RPers thoughts. For min-maxers, for people who don't read quest text, for people who don't think about the implications of Vol'jin's rejection of Garrosh, how would they order this list? Would they ignore it completely, because they rolled their toon for profession buff X or racial talent Y or class ability Z? Would that make it easier to order the list, because they don't consider their toon's identity to be complex? For me, because I do enjoy writing stories based around my characters' adventures, I thought a lot about how the different toons might label themselves. 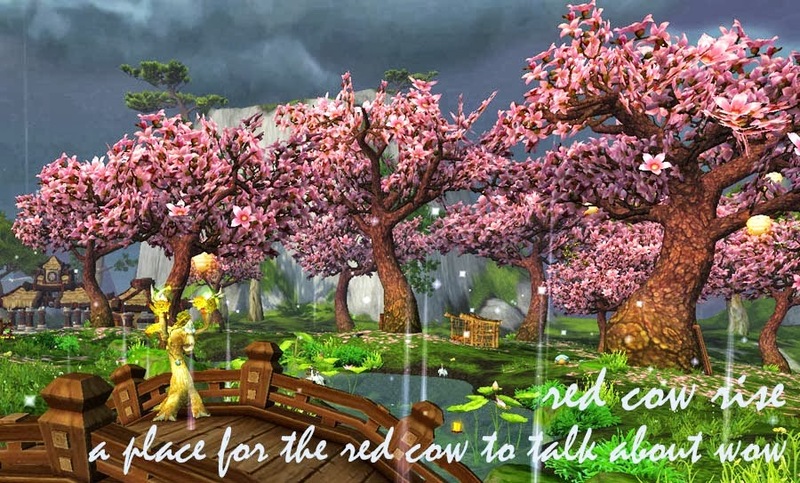 Akabeko has definitely always been a druid first, then a tauren, then Horde. Specifically, a huge part of her identity has been focused on being a resto druid, which gave me a lot of fun wordplay involving my branches, leaves, and roots. Before I knew that Aka was jaded but occasionally funny (she got it from the trolls - I feel like they would have good jokes), before she even had a personality and history, I "RPed" with her by injecting tree-related references into everything. I talked about splinters, wilting, and termites, and frequently fended off lumberjack attacks from guildies (you axe-wielding bastards). Perhaps you can understand why I was so upset when they removed perma-tree - I lost the #1 most important component of my identity. Who is this cow, and what have you done with my tree? Her personality has developed a lot more, and although she is still resto, her most prominent affiliation is merely druid. In keeping with the importance of druidism, the next component is faction - specifically the Cenarion Circle. I love my Guardian of Cenarius title and Hippogryph mount as accessories to accentuate my druidness. After that, I identify strongly with the tauren people and culture, as evidence by loving Baine and staying in the tauren section of Orgrimmar. Last, I am Horde, although significantly less impressed with Garrosh than I was with Thrall. I think that also ties in with where I stay in Org - I don't want to hang in the loud, smoky orcish main area. Iharu is a paladin, my second-highest alt and a curious project. She doesn't have much of a story, and her personality is derived from what I believe are belfy qualities, and yet she has the Crusader title and an Argent Hippogryph. I think I would say that she started out as a blood elf first, then evolved into paladin first, blood elf second. Last is Horde. Maybe. She's firmly Horde, but wouldn't talk about it with any enthusiasm. Sprinkie is definitely goblin first. She was strongly Bilgewater affiliated, but the more she sees of the world, the more I think she will let that go. I'm not sure what faction she will replace it with, though. I entertained the idea of the Kirin Tor, but her mageness is so far behind in importance that it seems out of place. She loves the Steamwheedle Cartel, but officially joining them might be too treasonous to her roots. As it is, I'm wondering if the Earthen Ring might be a good fit since she loves the environment. And money. Similar to Aka and Iharu, her use of a goblin trike rather than a sparkle pony (that seems magey, right?) indicates her close ties to her race rather than class. Maurene the warlock is firmly Forsaken. This informs her class (angry, bitter, a little unbalanced) and ensures that she feels no great love to the Horde war machine. There isn't really a "warlocky" faction in game, and no others seem appropriate for her personality, so I think solidly Forsaken is the only way to go. Alliance side, I have my original night elf priest, who is equally night elf and priest with Alliance as a distant second. She loves her city and Tyrande and sees her class as an homage to her ruler. My shaman, although languishing in her 20s, is first Wildhammer, second shaman, and third dwarf. She doesn't dislike dwarves or her Ironforge brethren by any stretch of the imagination, but her first loyalties lie to her homeland and native culture. I can't wait until she's high enough to get a gryphon. Overall, it seems that my carebear status and interest in all types of races has influenced my charaters' identities to not consider their factions central to who they are. For the rest, my knowledge of race and class informs how I approach the other affiliations. My intimate knowledge of druids, the tauren, and the current Horde policies makes defining Aka a snap. For my night elf priest, however, I know little about night elves and the Light so it's harder to determine what she thinks. I also think that factions or classes that have strong stories in the lore make for more compelling identifying characteristics. So being a paladin means having a faction to associate with, at least 2 titles to sport, and several class-appropriate mounts. It's easier to be visibly paladin than it is to explain how your personality is informed by your blood elf history. Have you ever thought about your character's identity? How would you label them, and why? Interesting look into your perspective for each of your characters! I also find myself creating personas for my character. Edenvale is the same way. I miss tree form, in raids, if you got disorientated you just "Run to the tree". I was a beacon, a landmark to orientate yourself. There were many comments of me being "limb-er", campfires unknowingly built underneath me or threats of decorating me for the holiday. I wish instead of taking away tree form they would have allowed us to change the color of our bark and leaves. I didn't like looking the same all the time but now you put all the druids together and we all look the same in tier gear. Eden wants to hug herself again. @RR: Yesss trees unite! Termite-addled minds think alike.